Where is summer? The weather has been so miserable where we are lately. I am sure it will pick up again and I hope soon. I would like to be back to lovely hot summer days so we can make the most of the outdoors this summer. We do spend a lot of our time outdoors during the summer months and it is really important to me to protect Sophia and Archie’s skin as much as I can. I have teamed up with Holiday Gems to tell you about my top tips for protecting my children in the summer months and hotter days. Here are some things I like to make sure of when I take my two out in the sun. 1. 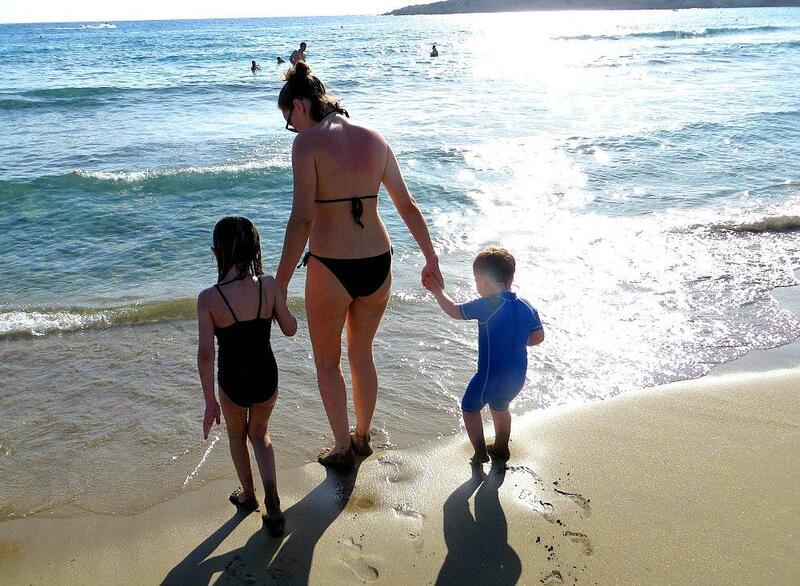 Wear sun cream – I always make sure to put sun cream on both my children on hotter days. I also do so in the morning before school if I know it is going to be a hot day. I usually go for a 30 factor or a 50 factor. I don’t like using sun block as such as I think it is good for them to get some Vitamin D from the sun. 2.I always take a hat out for both children if I know it is going to be particularly hot, as this protects and shadows their face from direct sun light. 3. I make sure to take a bottle of water with me everywhere because it is especially important to keep hydrated in the heat. Children can be so busy playing and forget to drink anything so I like to offer them water every now and then. 4.I like my children to try and wear protective clothing and still be cool. I usually like for their shoulders and back to be covered as these are the places that are exposed most to the sun. 5.If we are swimming I like them to wear a protective swimsuit, as you do catch the sun a lot more and a lot quicker in the water. I worry more about Archie as he is a lot younger then Sophia. I am quite happy for Sophia to wear a normal swimsuit to the beach as long as she has the protection of a full swimming costume. These are the five things I like to make sure of over the summer months to protect my children from any sun burn or skin damage. Have you got any other tips to share that I might have missed? Holiday Gems have also written their own top tips for keeping children safe in the summer. There are some great sun safety tips listed. Drinking water is a big one. Although lots of people smother their families in sun cream they forget about the danger of dehydration. Great tips to stay sun safe! Yes, this is so important. I’m always yelling at the kids to put their sun hats on hehe! Great tips here! I especially like the idea of wearing an UV swimsuit for little ones. Great tips, these! You know, it’s only just this year I learned that sunscreen has to be applied multiple times in a day to be effective (every two hours for me!). I always thought you put it on once and that was fine, until even SPF 50 was leaving me burnt as a crisp! totally agree with these. we also make our own healthy ice lollies. cooling, yummy and good for you! Sun cream for lips!! I always slather it on everywhere then forget about my lips. I found a lip balm stick last year with factor 30 in and I love it! No more sore lips! Ha. I’ve also invested in a hat this year too, I just hope I don’t lose it! During the hot summer months it is important to keep baby safe from the many hazards that the sun may cause. Infants have extremely sensitive skin that can be burned very quickly when exposed to the sunlight. Not only does the sun offer potential harm to a baby’s delicate skin, it also creates heat that could pose as a potential hazard to a newborn without caution. Although many baby’s will not wear a pair of sunglasses, if you can get your baby to wear them they do offer some great benefits. A pair of sunglasses can help protect baby’s delicate eyes from the sunlight. Protection from the damaging UVA and UVB rays of the sun is very important to your baby’s sight later in life.